Pahlish Rose Duo and Wilds Collection Swatches and Review! Hello hello there you all! I have some stunning polishes to share with you all today! Pahlish has 8 beautiful shades releasing for preorder February 17th at 7 PM CST until midnight on 2/19. The first two we're going to be talking about is the Rose Duo, and these will be $11 each. 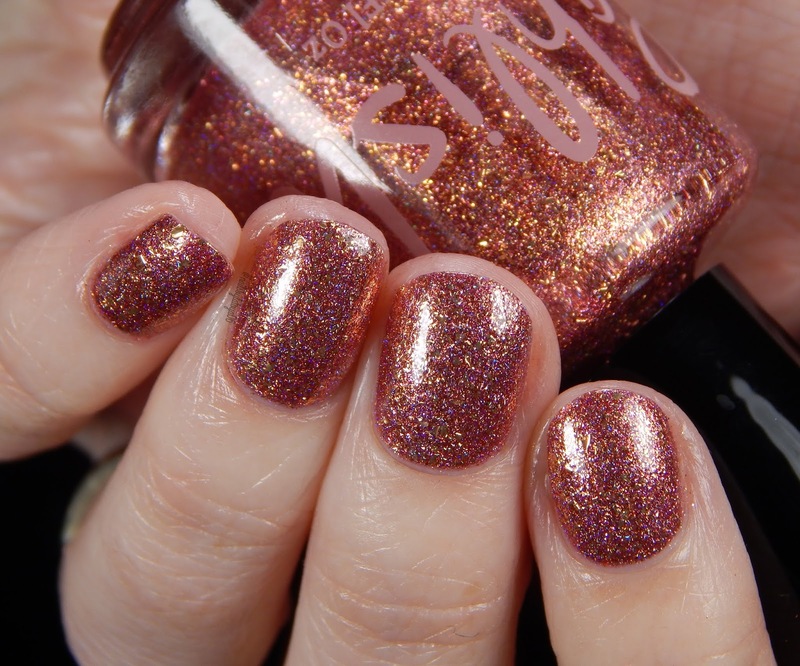 Ballerine is a gorgeous molten rose gold metallic with scattered holographic shimmer. I only needed two coats for opacity. Next up is Secret Garden, a delicate topper with a mixed of crushed gold flake, iridescent pink and orange flakes, soft metallic pink microflakes and scattered rose/green/copper shimmer. I used one coat over Ballerine. Now we're moving on to the Wilds Collection. These soft sparkling shades are inspired by the world's wild places. These are formulated to work perfectly layered with their opalescent Cloud Forest topcoat! These will be $11 each, while the Cloud Forest Topcoat will be $12. First up is Silverback- a sooty black with holographic flakes and scattered blue/gold/pink pigment. I only needed 2 coats for opacity. Now I'm going to show pictures of Silverback with the Cloud Forest topper. 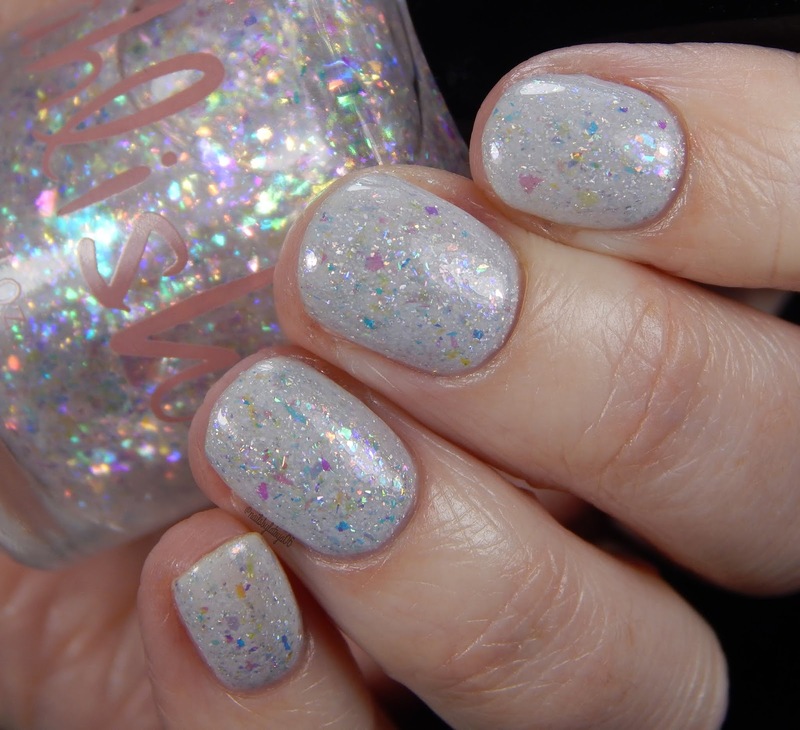 Cloud Forest is described as a opalescent crystal topper made with every flake that Pahlish had. I done one coat. Next up is Monsoon, a moody periwinkle with holographic flakes and scattered green/blue/gold pigment. I applied three thin coats for opacity. And now a couple of swatches of Monsoon with the Cloud Forest topper. I only used one coat over Monsoon. Desert Rose is next and this shade is described as a pale lavender with holograpic flakes and scattered green/blue/gold pigment. I applied three thin coats for opacity. And here's again, a couple of photos of Desert Rose with the Cloud Forest topper. I used one coat. Cascades is up next and this beauty is described as a clear sky blue with holographic flakes and scattered red/copper/green pigment. This shade.. oh my word it's gorgeous! I used three thin coats for opacity. And last but not least we have Dune- a fluffy marshmallow white with holographic flakes and scattered red/copper/green pigment. I applied three thin coats for opacity. And, here's Dune with Cloud Forest! I used one coat over Dune. And there you have it! I seriously love every single one of these shades and can't pick a favorite. Stay tuned for some spring inspired nail-art with these beauties... I'll have it up in a few days. Thank you all so much for reading!! !